MOSS GREEN SUPERLEAF 16 OZ. Moss Green Tone SuperLEAF! Excellent leaf coverage for evergreens, plants and bushes found growing in a variety of habitats including swamps, stream beds, North American as well as European deciduous forests.Available in a handly 16oz. (by volume) jar sealed with a plastic cap which provides two options for either spooning the leaves or shaking. Approximately 2 cups of leaves. 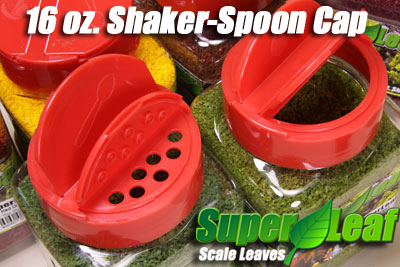 SuperLeaf Shaker Caps have a convenient shaker sifter on one side and a spoon-pour spout on the other. Great for precise application or large volume needs.